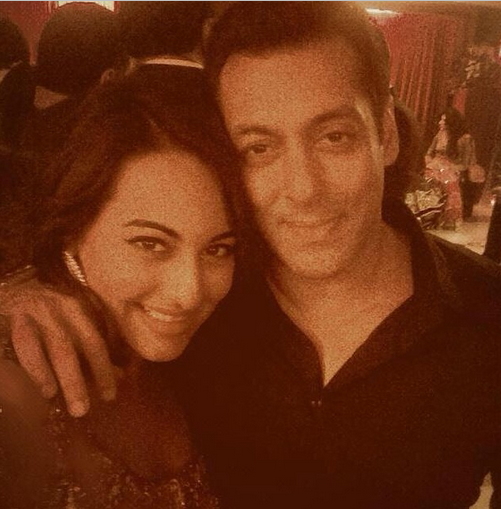 We posted here about how things were not hunky dory between Sonakshi and Salman. The media was abuzz with this and were keeping a keen watch on Arpita's reception. Sonakshi showed up at the reception and made sure that she was photographed right from the entrance. Not only that, she even took a selfie with Salman and immediately posted it on instagram. What people do not know is what followed after this picture. After this Salman scolded her openly in the presence of several guests. There was a loud argument where she was heard saying, "Maine aisa kabhi nahin bola." Daisy Shah and Niketan Dheer were within an earshot. Ashwini Yardi, a close friend quickly intervened and to make everything look normal, asked them to dance together. They did, but only for a couple of minutes. Cmmon! Sonakshi, you should know better- posting a selfie on instagram and dancing for couple of minutes would not prove anything.